Brand new dishwashers, awesome new stoves and ovens, along with brand new refrigerators are all types of appliances that are frequently called upon when trying to decide on interesting things to do when remodeling the kitchen area of the house. The kitchen is a great way to remodel part of your home, and choosing wood flooring in San Diego could be part of your decision process. Not only are there so many hardwood styles to consider, but other questions are important to consider, such as how long the whole process will take and if you will be without a kitchen for a day or a few weeks while the remodeling is happening. Most homeowners enjoy the time that they spend in the selection process of remodeling their kitchens. One of the most common additions that individual homeowners make when remodeling their kitchen is new cabinets. There are so many options to choose from, and simply adding new hardware can make a huge difference. If the current cabinets are sufficient then you may only need to do a cabinet makeover, which means simply adding a fresh coat of paint to them or resurfacing the faces with new wood doors. Of course, many people consider what would be ideal when remodeling their kitchen. Remodeling any room in the house is a big project to undertake anyway, so there are some individuals who just decide to go completely out on a limb and structurally change the way their kitchen is set up and build completely brand new cabinets, which could also lead to more storage. This does mean that you will probably be without your kitchen for a week or more, but the wait will definitely be worth it. Changes may be needed if you are going to switch appliances around, but some of the possibilities of this type of remodeling project include adding a built-in stove, adding and building an island to store pots and pans (which can also double as a chef's work place), as well as making more storage room and expanding the countertops and counter-space. All of these things will not only literally bring your kitchen to life, but they'll add an excellent value to your home that you've never had before! If you are a homeowner and you do decide to construct new cabinets in the kitchen then there are also a couple other options. First, consider whether or not you will keep the existing footprint or completely reconfigure your space to add a more open feel to your family or entertaining rooms. This brings the flooring into the equation as you may need to fill in your new open spaces. The floor is a big project to take on, and this could be a possible do-it-yourself remodeling project, for those of you who watch those TV DIY projects and are handy around power saws. If you’re not in a hurry to complete the floors in the kitchen, some people find that it is an enjoyable time when they re-do their kitchen floors by themselves. There are also many people who decide to tile the kitchen because they are afraid of the water useage and spilling on a wood floor. Laminate floors are also relatively easy to install just like they do on those TV programs and are a definite option to consider. 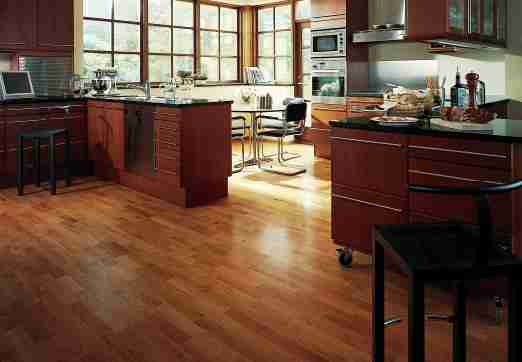 There are several laminate floors that are great for kitchens as they have newer sealers in the construction to help prevent moisture protrusion and some of them will even make it look nice and attractive just like wood flooring in San Diego. But in the end many of our clients truly prefer the timeless beauty and natural look of wood flooring and want Solana Flooring to install it for them. As long as you have a product with a finish that is in good condition and take precautions to keep larger amounts of water spills off the floor you should be fine with a wood floor in your kitchen.